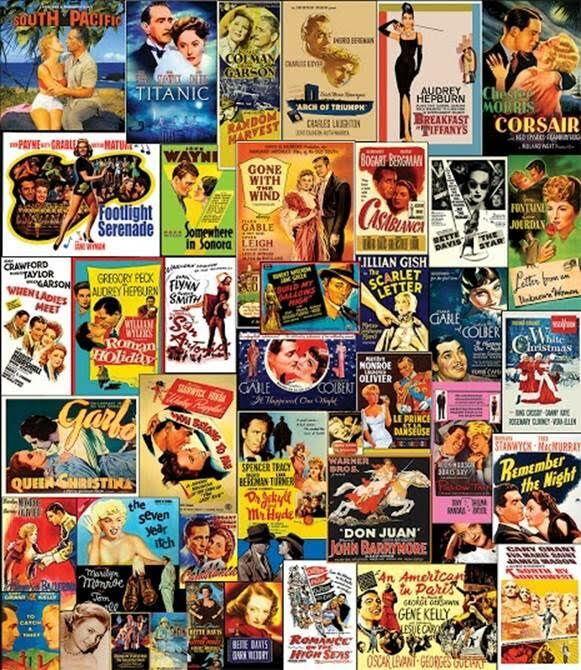 In the 1000 piece jigsaw puzzle, Movie Classics by White Mountain, a collage of classic movies is depicted. Like watching Turner Classic Movies on television, relax and return to the glory days of cinema with this collage by Lewis T. Johnson. Beginning with Ezio Pinza in South Pacific, you can "binge" with The Seven Year Itch starring Marilyn Monroe, Breakfast at Tiffany's with Audrey Hepburn, Gable's Gone With the Wind and Bogart's Casablanca, The Scarlet Letter with Lillian Gish, White Christmas with Bing Crosby, Queen Christina with Greta Garbo, and An American in Paris with Gene Kelly, or how about Dr. Jekyll and Mr. Hyde with the great Spencer Tracy? Many, many more! These are a barrel of fun to do! We love your puzzles!